Dosage: 1 wafer per day for dogs over 5 lbs and 1/2 wafer if under 5 lbs. It is so important to strengthen your pet's immune system every day with NuVet Plus From A Puppy through an Adult. Start your pet on the Path to perfect health with NuVet Plus the most powerful, all natural supplement available; recommended by leading veterinarians. Significantly reduce the risk or eliminate many problems that may strike your pet. your Pet – for life! and be sure and mention our breeders code 98362 for your DISCOUNT. Remember the more you order lowers your total cost and our breeders code gives you a great discount. Free radicals are a major cause of ill health in our beloved pets. To overcome it, NuVet Labs has developed NuVet Plus, Eight years of reseach and a team of Veterinarians, Physicians, Pharmacists and animal nutritionists led to the finest nutritional pet supplement available. A precise combination of Human Grade, Natural Vitamins, Minerals, Herbs, Antioxidants, bioflavonoids, Fatty Acids and Amino acids, Natural Ingredients, Contains No Fillers, No Artificial Flavors, and No Binding Agents, is completely safe and Nutrient rich, Combats disease where it starts from the inside and strengthens your pets Immune System. What is in NuVet Plus? Help Heal and Protect your Pet – for life! 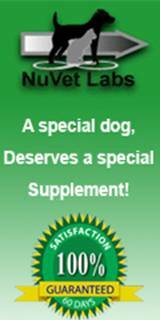 NuVet Plus can help heal and protect against the ravages of free radicals that attack your pet throughout its life. a higher immune system that NuVet Plus provides. We proudly stand behind our products with a 60-day, 100% satisfaction guarantee. If you aren't completely satisfied with NuVet Plus, we'll gladly give you a refund. Sit back in your easy chair and learn about NuVet Vitamins. be sure and mention our breeders code 98362 for your DISCOUNT. NuJoint Plus-Dog Hip and Joint Supplement.